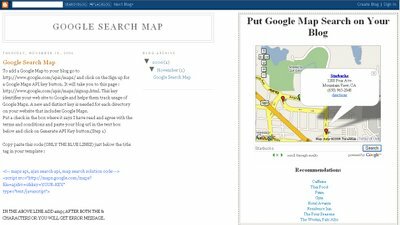 Add Google Map Search to Blog. ~ The Blog Doctor. You are here: Home > Google Map Search > Add Google Map Search to Blog. 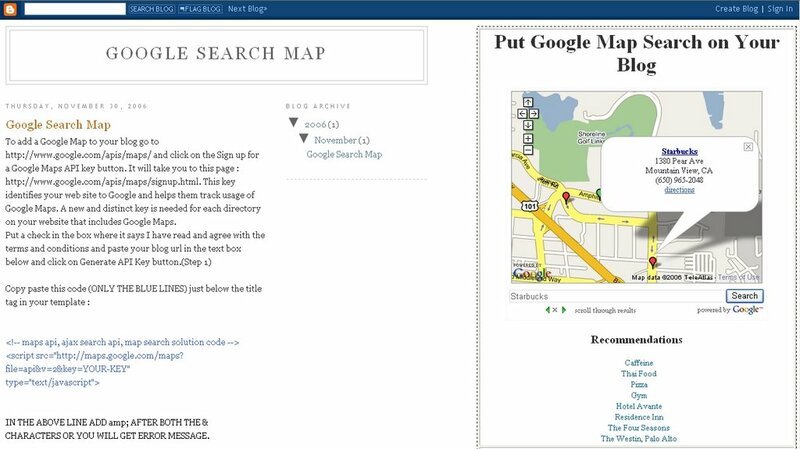 Add Google Map Search to Blog. http://www.google.com/apis/maps/signup.html. This key identifies your web site to Google and helps them track usage of Google Maps. A new and distinct key is needed for each directory on your website that includes Google Maps. It is necessary to have an empty space in the right hand part of the body of your template to add this in the way I have done. I have used the Minima template and added a float left property to the outside wrapper to create room for the Google Map on the right side. You might want to set some styling attributes on this element to constrain the width of the control, set a border or margin, etc. For example, a style rule like this might be useful. You can change the width to suit your blog. In addition to this base style, the height of the idle state map and the active state map is easily modified. Click above image to enlarge it.